Grain-free, sugar-free, egg-free, gluten-free, oil-free but still packed with flavour, these vegan peanut butter & jelly cookies are sure to be enjoyed! During my no-refined-sugar January, I came up with an adaptation of my flourless peanut butter cookie recipe (here). I basically wanted to experiment with the recipe, making it oil-free, egg-free, refined sugar-free and, obviously gluten-free. On a Sunday night, I decided to make these cookies for a Monday-night get-together and they were such a success, I got asked for the recipe by all in attendance! So ladies in my Monday-night Bible-study (and anyone else who is interested), here you go! 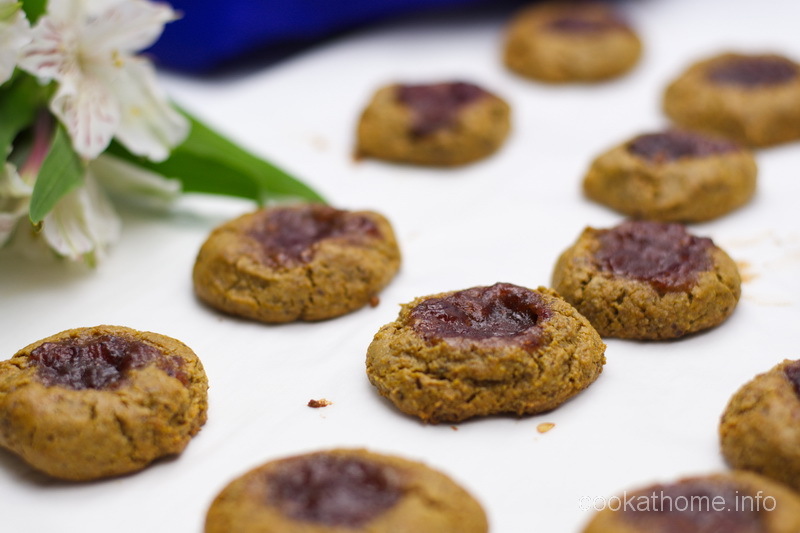 These vegan peanut butter & jelly cookies can be made to include chocolate (for chocolate peanut butter cookies) by including 30g cocoa and an additional tbs (30g maple syrup). I used the chocolate variety as the base of a chocolate peanut butter slice and they worked really well! 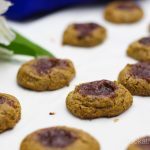 If you’re interested in other peanut butter and jelly cookie recipes, check out these here and here – some healthier than others, but always loving the classic combination! Mix all ingredients together very well. Roll into 1 tbs balls. Use your thumb to make a hole in the ball. Drop 1 tsp jam or fruit (any flavour) into the hole. Bake for 10 minutes. Leave on the tray for at least 10 mins prior to moving to a cooling rack to cool completely.